Hard and icy in the A.M. Soft and dreamy in the afternoon. I poached Cathedral Brook, it skied like a dream.."
April 9 2011 Tons of snow left great late morning conditions a little mushy in the afternoon. This video is from Saturday. Nice patch! Can any Belle experts identify the trail? Onteora I think is the trail next to Mohawk and Yahoo on the other side. 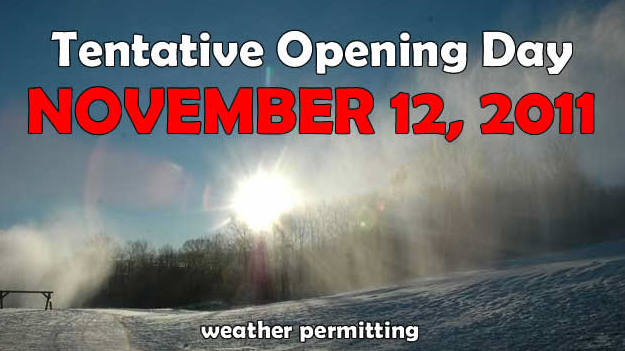 "Snowmaking begins tonight which means opening day is around the corner." Belleayre planned to open tomorrow 12/10 with top to bottom on Onteora (black diamond) via Chair 7 and some beginner terrain on lower mountain on Iroquois and Running Bear Via Chair 1 and a Handle Tow. The temps never got out of the upper teens , they only hand 4 snow guns running ,on Upper Bell run?? ?